A new, ultrathin film that is both transparent and highly conductive to electric current has been produced by a cheap and simple method devised by an international team of nanomaterials researchers from the University of Illinois at Chicago and Korea University. The film is also bendable and stretchable, offering potential applications in roll-up touchscreen displays, wearable electronics, flexible solar cells and electronic skin. The results are reported in Advanced Functional Materials. The new film is made of fused silver nanowires, and is produced by spraying the nanowire particles through a tiny jet nozzle at supersonic speed. The result is a film with nearly the electrical conductivity of silver-plate—and the transparency of glass, says senior author Alexander Yarin, UIC Distinguished Professor of Mechanical Engineering. "The silver nanowire is a particle, but very long and thin," Yarin said. The nanowires measure about 20 microns long, so four laid end-to-end would span the width of a human hair. But their diameter is a thousand times smaller—and significantly smaller than the wavelength of visible light, which minimizes light scattering. "The liquid needs to be atomized so it evaporates in flight," Yarin said. When the nanowires strike the surface they are being applied to at supersonic speed, they fuse together, as their kinetic energy is converted to heat. "The ideal speed is 400 meters per second," Yarin said. "If the energy is too high, say 600 meters per second, it cuts the wires. If too low, as at 200 meters per second, there's not enough heat to fuse the wires." The researchers applied the nanowires to flexible plastic films and to three-dimensional objects. "The surface shape doesn't matter," Yarin said. The transparent flexible film can be bent repeatedly and stretched to seven times its original length and still work, said Sam Yoon, the corresponding author of the study and a professor of mechanical engineering at Korea University. 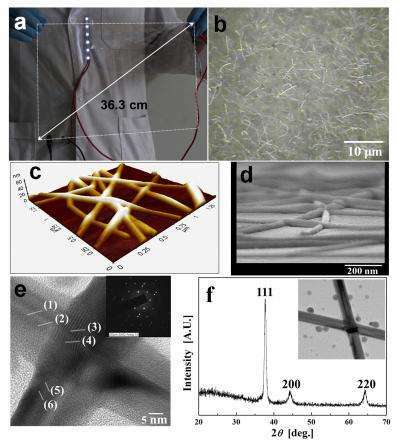 Earlier this year, Yarin and Yoon and their colleagues produced a transparent conducting film by electroplating a mat of tangled nanofiber with copper. Compared to that film, the self-fused silver nanowire film offers better scalability and production rate, Yoon said. "It should be easier and cheaper to fabricate, as it's a one-step versus a two-step process," said Yarin. "You can do it roll-to-roll on an industrial line, continuously."